Shayna Schafter as Anne Frank and Jonah Alm as Otto Frank. 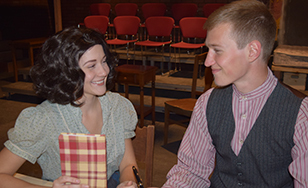 The College of St. Scholastica Theatre's performance of the Pulitzer Prize-winning drama "The Diary of Anne Frank" will open on Oct. 28. Based on the book "Anne Frank: Diary of a Young Girl," the play was written by Frances Goodrich and Albert Hackett. The production is directed by Merry Renn Vaughan, associate professor and chair of the Communication, Theatre and Art department. The play tells the story of Anne and her family, who were forced to hide in a secret annex space as the Nazis deported the Jews of Holland to their deaths. In her secret attic, Vaughan explains, Anne comes of age: she laughs, plays, fights with her mother, and falls in love for the first time. In spite of her oppressive circumstances, Anne's spirit transcends, as she voices her belief, "in spite of everything, that people are truly good at heart." "Anne's persistent optimism continues to resonate, making her story as relevant for today's audiences as it has ever been," Vaughan said. She added that the play will be presented "environmentally," or with the actors and audience members sharing much of the same space. "The audience will feel like they are in the attic with Anne and the others," Vaughan said. Shows are at 7:30 p.m. on Oct. 28-29 and Nov. 3-5. Sunday matinee performances will be at 2 p.m. on Oct. 30 and Nov. 6. All performances will be at the St. Scholastica Theatre behind Tower Hall. Tickets are $15 for adults and $10 for students and seniors. For more information, call (218) 723-7000 or visit spotlight.css.edu. This production is supported in part by a grant from Pachel Foundation. "Orestes: Blood and Light" in March/April (written by Helen Edmundson; based on Euripides. Directed by Shane May).